chicken-related texts seem like good candidates for 2011.
bottom of my reading list. books are at the top of your reading list this year? I think Alanna Moore lives not far from me. I was going to go to a chicken workshop she ran, but the date got changed at the last moment (not her fault!) and I couldn’t go. Another book that’s not bad is Jackie French’s “Chook Book”. 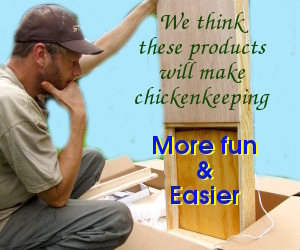 Very well suited to Australian backyard chicken keepers, but possibly useful for you too. Jackie doesn’t subscribe to all the standard recommendations – she tries stuff herself and reports on what works. She has other books on self-sufficiency related topics, is a well-known magazine contributor here in Australia, and also writes fantastic childrens’ books. Thanks for the recommendation — I’ll add it to my reading list! I’m always glad to hear firsthand data about the authors of books too. It makes me more inclined to read Alanna Moore’s book sooner rather than later.